Bathroom tile patterns must be executed with perfect installation if you want to achieve the desired effect - a professional designer bathroom. 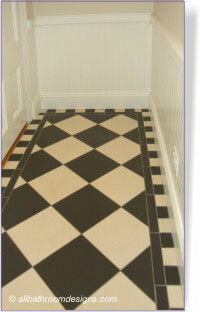 When bathroom tiles are laid in the standard grid pattern, it is not difficult to get them perfect. When you start playing around with various bathroom tile designs though, you need a bit more planning first. 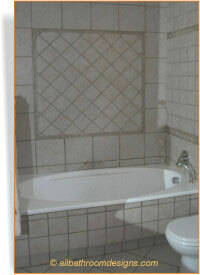 Some tiles such as natural stone bathroom tiles are more forgiving due to their natural unevenness. Every area and surface in this bathroom has been carefully considered and planned. 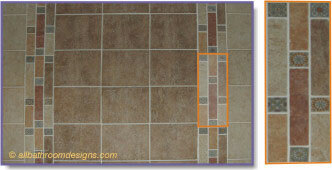 Different dimensions of the same stone tile are then used for each space. Very large bathroom floor tiles are used with smaller square tiles placed on the diagonal and narrow rectangles to treat "leftover" areas. However, those leftover areas do not appear to be problem areas now, because the space has been dealt with so cleverly in the bathroom tile design. The effect is one of pleasing shapes, patterns and rhythms. The wainscoting area is finished off with a beautiful custom made accent tile. 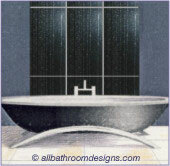 Bathroom ceramic tiles are manufactured to uniform size and thickness. A neutral bathroom needed variation on the bathtub wall and a perfect square gets some detailed attention. Note how the very small triangles along the edges are all exactly the same size and the X formed by the center diagonal lines meet at the corners. The accent tiles on the adjacent wall further serve to lead the eye to this area. If the bathroom tile patterns were not this exact, it would be jarring on the eye. What should have been a feature, would turn into an amateurish attempt at decoration. Did we make our point already? This is a simple bathroom tile pattern that could have made such a strong design statement ... with such a poor execution and end result. Quite often bathroom tile layouts will fit one area perfectly but then overflow into another area where it just does not work. You therefore need to look at the whole area and if need be, do a scale drawing to see if your patterns will run into problems. Of course it will mean a bit more work, but the end result in all its perfect symmetry will be worth it. 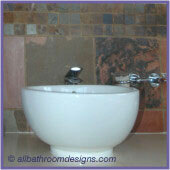 You can achieve great bathroom tile patterns with small details. Bathroom border tiles can be quite expensive and your budget may not stretch to using them all over - nor is there a need to. A skilled bathroom contractor or craftsman can modify standard tiles to accommodate an accent inset to match your wall tiles. 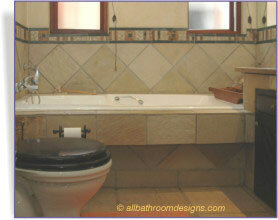 bathroom tile design ideas page. Do you want something uniquely yours? Then take this idea one step further. Although it looks like various mosaic tiles and rectangular strips, it is one tile. You can follow the layout though and create your own composition. You don't need to get all the shapes from the tile supplier either. 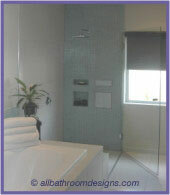 Have a look at our Bathroom Tile page for more Bathroom Tile Designs. As if the choice of bathroom tiles is not confusing enough, there is a myriad ways that you can arrange them to create bathroom tile patterns unique to your bathroom. It is such fun though!